Today.Az - Ice bucket challenge: What's happened since? Last summer, social media was dominated by videos of people having a bucket of cold water poured over their head. So what was it all for again and how much did the charities benefit? Everyone knows someone who did the ice bucket challenge at some point last year (if you didn't actually do it yourself). Videos were shared, friends were nominated and countless celebrities were doused - all for a good cause. In what has been described as the world's largest global social media phenomenon, more than 17 million people uploaded videos to Facebook which were then watched by 440 million people worldwide. And the charities connected to the challenge saw the money roll in. In the UK, the Motor Neurone Disease Association raised £7m from the challenge, thanks mainly to the ingenuity of a couple from Yorkshire. Paula and Robert Maguire spotted the challenge starting to go viral in the US and set up a fundraising page for those taking up the challenge in the UK. A few years previously, Paula's uncle had died from MND in the space of nine short weeks and they were determined to help raise money and awareness for the debilitating disease. "We were watching the news and the Kennedys had challenged Barack Obama to do the ice bucket challenge in the US. We immediately thought we wanted people to connect ALS in the US with motor neurone disease (MND) in the UK." They set up the text number ICED55, completed the ice bucket challenge themselves in early August and set a target of raising £500 for the MND Association. To date, their efforts through that online page have raised more than £4m for the charity. In the US, the ALS Association - which represents people with amyotrophic lateral sclerosis (also known as Lou Gehrig's disease) and all motor neurone disorders - received $115m in donations during August and September 2014, when the challenge was at its peak. 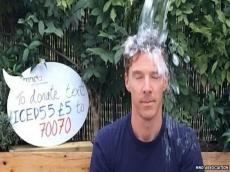 Chris James, director of external affairs at the MND Association, admits it has been an extraordinary 12 months, which started with Benedict Cumberbatch doing the ice bucket challenge in aid of the charity and ended with MND being the focus of a major storyline in the BBC drama Casualty. In between, Eddie Redmayne won an Oscar for his portrayal of Prof Stephen Hawking, who has MND, in The Theory of Everything. "There has been nothing this big before in fundraising and voluntary donations. It has enhanced our view of social media. "Previously it was looked at as a communications tool - but now it's seen as a core communications tool for particular campaigns." But the charity has decided not to ask people to pour water over their heads again this summer. "We felt we raised a significant amount of money and awareness last summer. While people might be keen to do it again, we wouldn't say please do it again," says Mr James. Instead, they created an ad campaign to say thank you to their many donors, which also reminded the public what the ice bucket challenge was really all about and who it was for. There are approximately 5,000 people living with MND in the UK. Mr James says the challenge made some of them feel less alone because there was greater awareness of the disease and the suffering it causes. The challenge has had a positive effect on research into the causes of the disease too. An international project to analyse the genomes of 15,000 people with MND, including every person in the UK with the disease, has been accelerated by funding from the ice bucket challenge. Prof Ammar Al-Chalabi, professor of neurology and complex disease genetics at King's College London, says it's "a massive project which will produce enough data to fill 10,000 hard drives". Project MinE will enable scientists to compare the genomes of people affected by MND to those unaffected, getting them closer to isolating the genes that increase someone's risk of getting the disease. With £5m pumped into research, £1.5m has been allocated to care and support services for those with MND and the rest to funding new care centres and setting up grants for young carers. So have there been any negative aspects to the ice bucket challenge? Prof Al-Chalabi says there is a danger the public might think these diseases don't need any more money - and yet the opposite is true. "We need a continuous ice bucket."